The G/L Community Fund was established in 1995. 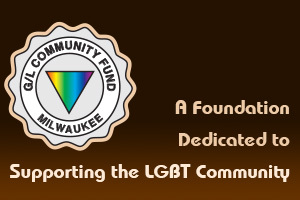 The Community Fund serves for social change on behalf Gays and Lesbians in Southeastern Wisconsin. We help grass roots organizations and the underserved groups who do not have the resources to do major fundraising, or are unable to receive grants from large foundations. We work with several organizations that are listed under the ‚"Southeastern Wisconsin Coalition". New members are always welcomed, and can contact us at any time. One hundred percent of the funds raised for coalition members are distributed annually. If you wish to make a gift to an organization that is not among the coalition members, we will forward your gift provided we have their contact information. Unrestricted funds are used for grants and gifts to community organizations or programs. Grants are made to small LGBT groups in the Milwaukee Metro Area. Letters of intent may be submitted at any time, if a full application or more information is required a letter will be sent to you. The board of directors will consider all grant request quarterly. Our long term goals for the LGBT community consist of the G/L Community Endowment Fund and the Building Fund. The G/L Community Fund is operated by volunteers with no paid staff or expensive overhead.